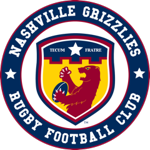 The Nashville Grizzlies RFC is a USA Rugby Division III men's rugby union club. We are a socially and ethnically diverse group of guys ages 19-50 learning a great sport, getting some good exercise and giving back to our community. We welcome new players, gay and straight, experienced, new to rugby or even new to organized sports. Rugby has a position for every build so come out and give rugby a try! ©2019 Nashville Grizzlies RFC / SportsEngine. All Rights Reserved.